Three out of four women from China that have been charged with cheating on language exams to gain admission into American universities have pleaded guilty. The case highlights the growing phenomenon of Chinese students who use fraud to enter the U.S. education system, an industry that in the last decades has seen an ever-growing reliance on tuition from Chinese students. Earlier in May, U.S. prosecutors arrested Yue Wang, Shikun Zhang, Leyi Huang, and Xiaomeng Cheng, all Chinese students in the United States on F-1 student visas, and charged them with conspiracy to defraud the United States. Prosecutors said that Wang, a student at Hult International Business School, was paid to take the TOEFL exam for the other three Chinese students, who used their fraudulent test scores to gain admission to U.S. colleges, including Arizona State University, Northeastern University, and Penn State University. The students then obtained visas from the U.S. State Department based on their admission offers. TOEFL is an exam widely used to assess the English-language competency of foreign students aspiring to gain admission into U.S. colleges and around the world. The test is used by more than 9,000 colleges, universities and agencies worldwide. Prosecutors said Wang was paid $7,000 to take the test in 2015 and 2016 for the other Chinese students, after they previously took the test and failed to meet the minimum scores required to enter their respective U.S. colleges. While each of the women faced up to five years in prison if convicted, Cheng, Zhang, and Wang have agreed to plead guilty on Aug. 30 in exchange for prosecutors reducing their sentences to time served and deportation to China. Leyi Huang declined a similar plea deal. Among Chinese students the illicit practice of hiring an impostor (also known as a “gunman” in Chinese) to take the entrance exam has been a widely-known phenomena that has existed for years in the country’s multi-billion dollar overseas education industry. For example, a federal indictment in 2015 charged 15 Chinese nationals with cheating the college entrance examination system using fake passports and test-taking impostors, according to the New York Times. Screenshot of a Chinese website that sells the service of taking entrance exams for Chinese students. The website discusses U.S President Trump’s crackdown on immigration fraud, such as the fraudulent TOEFL exam takers, and says for that reason the company will avoid doing the exams in testing centers around the United States. A random search on the internet immediately shows at least a dozen Chinese websites in the first few pages of search result selling the taking of TOEFL and other entrance exams. The vendors usually guarantee a high score on the TOEFL test, which the buyer can then use to apply for admission into U.S. colleges. One such website—yhtoefl.net—sells not just TOEFL, but also other more advanced admission tests such as the GRE (Graduate Record Examination) and the SAT (Scholastic Aptitude Test, used for admission to U.S. college). 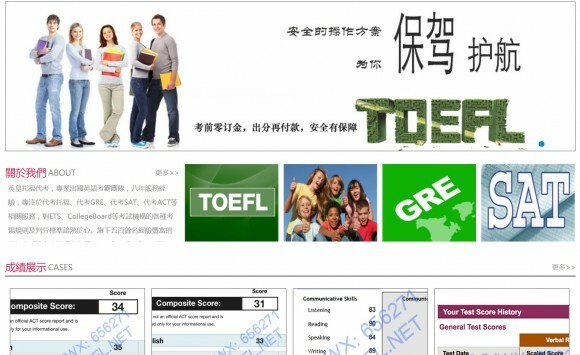 The yhtoefl.net website, which provides no information about what company owns it or its physical address, prominently displays examples of TOEFL scores that have been “commissioned” in the past, and says that the company has “8 years of experience” in the business and employs over 500 “professional exam takers” across China, Hong Kong, Singapore, and other major cities where exams can be taken. The website charges a “reasonable price” for the TOEFL test, which ranges from 10,000 to 30,000 Chinese Yuan (US$1,500 to US$4,500), although it is unknown how such a price compares to the industry average. The same website even published an article discussing the May 2017 case concerning the four Chinese students in this story. 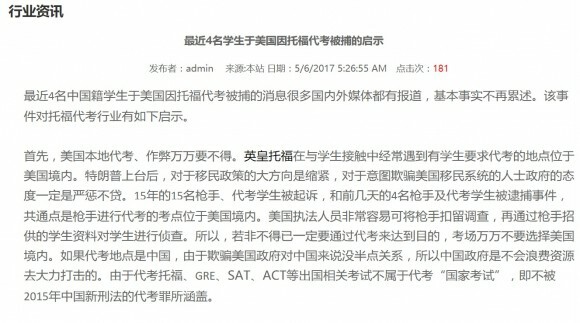 Screenshot of a Chinese website that sells the taking of entrance exams for Chinese students. The website discusses U.S President Trump’s crackdown on immigration fraud, such as the fraudulent TOEFL exam takers, and says for that reason the company will avoid doing the exams in testing centers in the United States. The number of Chinese students coming to the United States for higher education has seen a rapid increase over the last decade and in 2016 reached a record of 304,000, or 31 percent of all foreign students in the United States, according to a report by the Migration Policy Institute. The phenomenon reflects China’s increasingly affluent population, many of which can afford to pay a hefty sum for an American education that brings prestige and a prospect for a good job. Northeastern University in Boston, MA, which admitted one of the students convicted in this TOEFL fraud case, has 11,702 international students in the current academic year and is home to one of the largest Chinese-student populations in the country. Unlike American students, international students such as those from China tend to pay the full cost of tuition, which is often twice or more the amount that their American classmates pay. Many U.S. universities and colleges that have had trouble finding enough native students have now opened their doors to a massive amount of Chinese cash by admitting a large number of Chinese students. And many of these are not competent in English. The high concentration of Chinese students often means that the new students spend most of their free time with other Chinese, and their English remains poor even after years of living and studying in the United States. The industry that cheats on TOEFL and other entrance exams has most likely made the situation for Chinese students worse. According to a recent story by John Pomfret, the former Beijing bureau chief of The Washington Post, many educators and students have privately acknowledged that U.S. institutions face an “endemic and terrible problem” with mainland Chinese students, as the system is increasingly seen as broken and plagued by abuses. In the same story John Pomfret points out that because a large number of Chinese students in America lack the necessary skill in English, these students fail to integrate into the U.S. environment, which can lead to more serious problems. The poorly-integrated students, according to Pomfret, could be easy targets for the Chinese regime to influence and control through propaganda and regime-run apparatuses overseas. One such apparatus is the Chinese Students and Scholars Association (CSSA), a state-supported Chinese organization involved in controlling and spying on Chinese students and scholars overseas. Chinese students not prepared for an American education naturally gravitate toward organizations such as the CSSA because “it offers us a place to go when we’re homesick,” according to Pomfret’s interview with a Chinese student.